Police have issued images of a man they wish to trace in connection with the assault in Edinburgh. 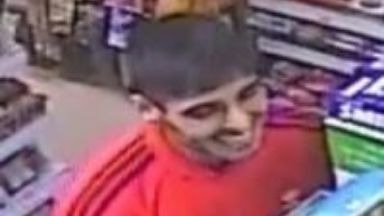 Police have issued CCTV images of a man they want to trace in connection with a serious assault in Edinburgh. The attack happened at around 1.15am on Monday December 3, last year, on St Mary's Street. A man was sitting in his parked car when he was struck on the face with a sharp weapon. The victim suffered a serious facial injury and was taken to hospital for treatment. Officers believe the man pictured may be able to assist with the investigation. He was wearing a red Adidas tracksuit top and blue jeans and is said to have spoken with an English accent. Detective Constable Scott Dugan, from the Violence Reduction Unit at Gayfield Police Station, said: "The victim has sustained a painful injury to his face during this incident and we are continuing with our investigation. "As part of these enquiries we are keen to speak with the man pictured in the CCTV footage. "If anyone can help us identify this individual, or has any other relevant information then please contact police immediately."